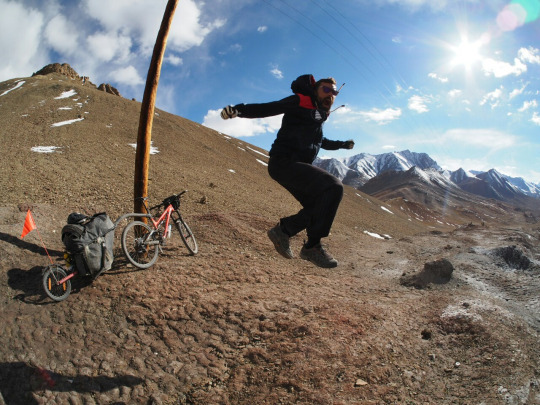 Pierre is just back from his journey through Georgia, Armenia, Iran, Tajikistan and Kyrgyzstan with his MTB and KIT L80 bike trailer. “Praise to the iron horse. It dealt brilliantly with the road and made the journey all the more enjoyable. Minor servicing was enough to keep the beast going. I saw several people who had problems, broken steel frame and broken paniers. Also, the unpaved sections were a lot smoother on my ride, especially downhills. It didn’t look enjoyable riding without suspensions. And I was much faster in rough terrains. I had a peace of mind knowing that my rig would deal with the bumps and holes and that my powerful disc brakes would not dangerously fade during long descents, as I saw riders with calipers brake struggling to slow down during long heavy braking sections. 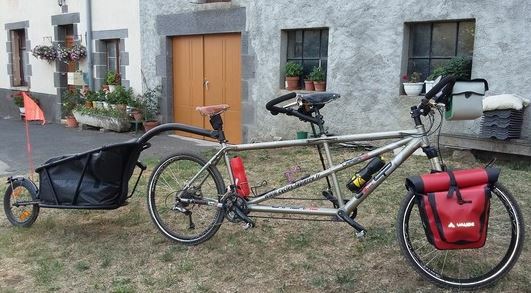 I didn’t see anyone else with a bike trailer, and the other tourers were quite interested in my setup. 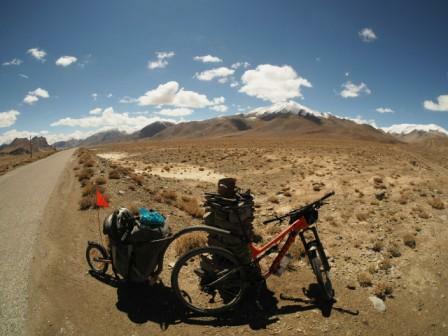 I would not change for a regular touring bike with panniers for this kind of journey. I have now reached Khorog, the biggest town in the Pamir. I have followed the valley of the Panj river for a few hundred km. On my right side was Afghanistan and what was merely more than a footpath along the river as the asphalted road I used was on the Tajik side. What a contrast. Afghan villages are beautiful and the landscape is breathtaking. There are natural springs which are a blessing, finding fresh cold water now fulfills me with joy. I have slowed down a bit, actually no, I just ride less km per day. I don’t want to arrive tired when the climbing and altitude will get serious. I see a lot of local people, grown ups, just waiting, sitting on their heels at the roadside, seemingly waiting for time to pass. There are a lot of children, stopping you with “hello” and “bye bye” without distinction, and recently they wanted high five, even when you are suffering like a beast in an ever so steep climb, or flying downhill. No distinction. However, from around age 7 I would say, the kids run the business in the smallest villages. They are in charge of the food stalls, dealing with foreigners, laundry, collecting wood, shepherds, you name it. Of course adults also work, but I see a lot of child labor. It does not look terrible, and they still play, but they kind of help a lot. From what I can see of the Afghan side, there are also lots of kids, but those I see are usually bathing in the river. I saw a few times what were probably big schools for the children of the area. The Afghan wear traditional clothes. Sometimes it feels like you could touch the other side. Read about Pierre’s adventures on his blog : click here. Aevon bike trailers do not just carry your stuff around, they also help to create contact anywhere ! 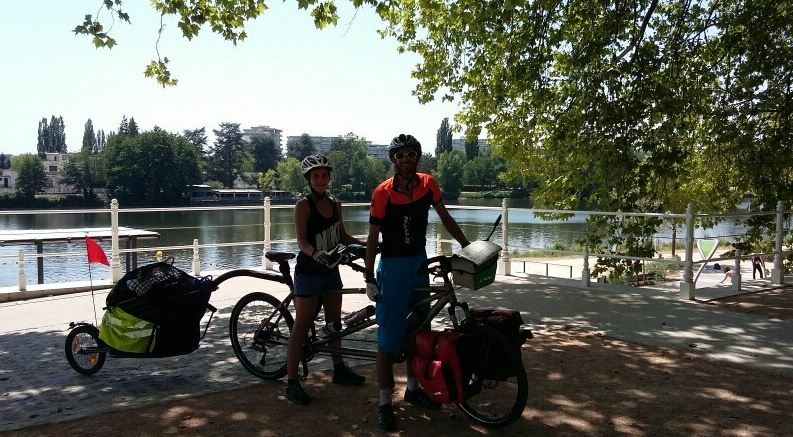 Vincent and Sarah, two doctors, decided to go to Istanbul by bike and trailer for their honeymoon (July 2015). To fulfill their project of a journey by bike, Vincent and Sarah bought a trailer AEVON STD 100 to help them carry all their stuff. 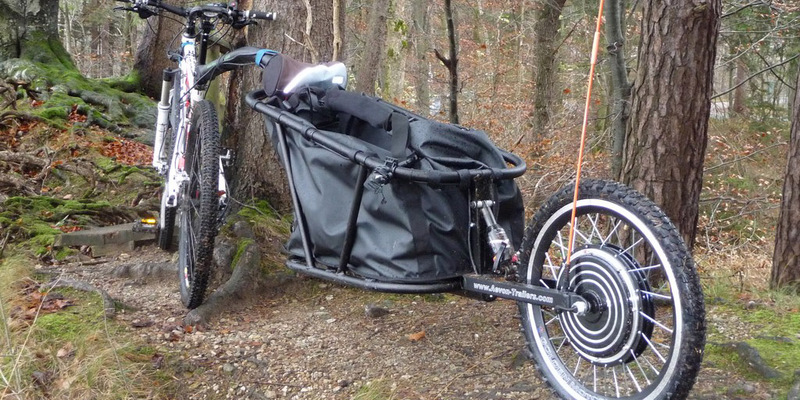 This bike trailer’s bag is waterproof, which is essential for a bike trip. “Day 7 : from Saint-Jean de Losne to Besançon : 105 km. We went through the Doubs’ valley and reached Switzerland’s border faster than expected. Day 12 : from Lörrach to Stühlingen : 105 km. We didn’t really intended to cycle for so many kilometers, but there is only a camping every 50km and we didn’t want to sleep under the stars so we had to cycle. Day 19 : from Ingoldstadt to Bad Abbach : 70 km. The sun is back and the road is more and more beautiful ! Day 25 : from Schönbühel to Klosterneuburg, 10 km before Vienna : 98 km. This is it ! We reached our first goal : join a capital ! After facing the wind which slowed us, we arrived exhausted in the capital of Austria. Day 43 : from Brza to Simeonovo : 106 km. We broke the speed record with 62km/h, we travelled for more than 3000 km (3024 km exactly). Day 51 : from Biser to Edirne : 76 km. […] Almost 3x months, 3634 km, a lot of love, and a big adventure. Cyclable is a network of 25x shops, all located in city centres across France. Specialized in city bikes and travels by bikes, they choose only quality and innovative products with very little maintenance. 5000x users choose their bike at Cyclable every year. Now these users will be able to choose their Aevon trailers as well, the only trailers made in aluminium with a very easy to handle system of hitch on the seat post. Making a U-turn, taking a ride on mountain tracks is only possible if you choose the Aevon brand.